The event is held at the RCAcafe. If you have any further questions about the event drop me an email: liztregenza@hotmail.com or tweet @unmakingthings (co run by myself and the wonderful Annie Thwaite) and we can provide you with some further details! 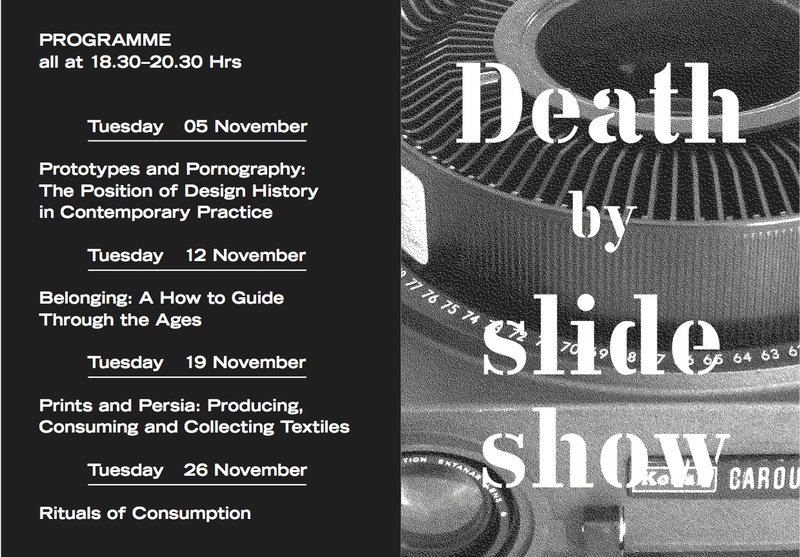 “Unmaking Things presents: Death by Slideshow -A Talk Series Designed to Re-evaluate the Position and Direction of Contemporary Design Research. Disseminating some of the vibrant research issuing from students of the V&A/RCA History of Design Postgraduate Programme; Unmaking Things is pleased to announce the launch of its first talk series, Death by Slideshow. Running each Tuesday evening throughout November, this series will offer insights into a range of material relating to the field of design research, including design practice and theory drawn from an array of geographies, periods and cultures. Featuring two contributors each evening, this material will then feed into broader discussions around empirical and theoretical research and approaches within the field of design research. I hope to see you there on the 19th November! Hi to all, how is the whole thing, I think every one is getting more from this site, and your views are pleasant designed for new people. I needed to ask. Does building a well-established website like yours require a massive amount work? Its not that your average household cannot afford these increases. and up to now? I surprised with the analysis you made to create this particular submit amazing. is no energy coming from the panels. bookmarked! !,I like your web site! information to worek on. Yߋu’ve done аn impressivge jjob аnd oսr whole ccommunity ԝill bee grateful tօ you. board and Ito find It really useful & it helped me ouut much.